ell Inspiron 3520 targets a pretty wide market segment as this machine incorporates the two characteristics that rarely go hand in hand… these are money and quality. Let’s peek under the chassis of Dell Inspiron 3520 and see whether it will surprise us and how. Starting with the processor, which can be Celeron @ 1.7GHz, Pentium @ 2.4 GHz or the 3rd generation i3 and i5 respectively at 2.4GHz and 2.5GHz. The chassis comes in a simple design with smooth finish and clean lines. The opening mechanism is stable and allows a pretty wide opening angle. However, the machine looks bulky as you can see for yourself, it is quite thick as well. Its weight of 2.4kg goes a little far from what I would prefer. If it can be any consolation the case it comes in two colors – obsidian black and Apple red, which personally I like better. The display has a 15.6 inch diagonal and is LED backlit. It features True Life technology at the HD resolution of 1366×768 pixels. The keyboard is the most-commonly used island-style type. The keys provide a perfect response with their short stroke, their elegantly curved edges contribute to the overall classic design lines. Below you will find the touchpad which is a typical one with the two independent auxiliary keys. The speakers are two but they are placed in a , each 2W powerful and the sound quality is ensured by the Waves MazzAudio 3 techonology. You have a pretty big freedom when it comes to hardware. Starting with the processor, which can be Celeron @ 1.7GHz, Pentium @ 2.4 GHz or the 3rd generation i3 and i5 respectively at 2.4GHz and 2.5GHz. The chipset abbreviation is Mobile Intel HM75 Express chipset. Our test sample featured core i5 and it provided a pretty smooth performance. The operating memory is also your choice, you can load this machine with 2GB or 4GB of DDR3 at 1600MHz. The video card on board is either the Intel HD Graphics 3000 or the 4000 version, depending on the processor selection, of course. The 750GB SATA hard drive storage at 5400rpm will provide tons of space for your music, videos and photos. 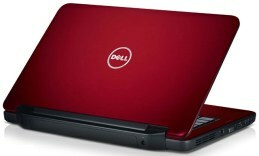 The 6-cell battery inside Dell Inspiron 3520 ensures 48WHr which is a standard for this class. This Dell machine provides for you the comfort and quality needed for a good video call it is equipped with 1MP HD webcam with a built-in analog microphone. All you have to do is press the call button to say hi to your family and friends. The chassis features all the necessary ports and slots to make your machine connectable to whatever you wish, it has an HDMI port, VGA port, 3 USB ports v2.0 and 3-in-1 memory card reader. The Dell Inspiron 3520 comes at the average price of $400 with the brand new 64bit Windows 8.